Wing span: 1 3/4 - 2 1/2 inches (4.5 - 6.4 cm). Identification: Small with short hindwing projections. Forewing above is brownish-orange with dark spots; one dark spot at center of bottom edge. Hindwing above has two patterns: summer form is mostly black, winter form is orange with black spots; both have a dark border containing pale spots. 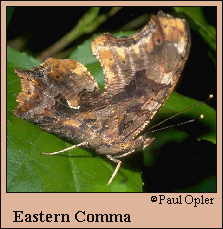 Underside is brown; hindwing with a central silver or white comma which is swollen at both ends. Life history: Males perch on leaves or tree trunks to watch for females, flying aggressively to chase other insects or even birds. Eggs are laid singly or in stacks under host plant leaves or stems. Caterpillars are usually solitary and feed on leaves at night. Older caterpillars make daytime shelters by pulling leaf edges together with silk. Winter form adults hibernate, some first migrating to the south. Flight: Overwintered adults fly and lay eggs in the spring until the end of April. The summer form emerges and flies from May-September, laying eggs that develop into the winter form. These adults appear in September or October and soon seek shelter in which to overwinter. Caterpillar hosts: All members of the elm and nettle families including American elm (Ulmus americana), hops (Humulus), nettle (Urtica), false nettle (Boehmeria cylindrica), and wood nettle (Laportea canadensis). Adult food: Rotting fruit and tree sap. Habitat: Deciduous woodlands; woods near rivers, marshes, swamps, and other water sources. Range: Eastern half of the United States east of the Rocky Mountains from southern Canada to central Texas and the Gulf Coast.